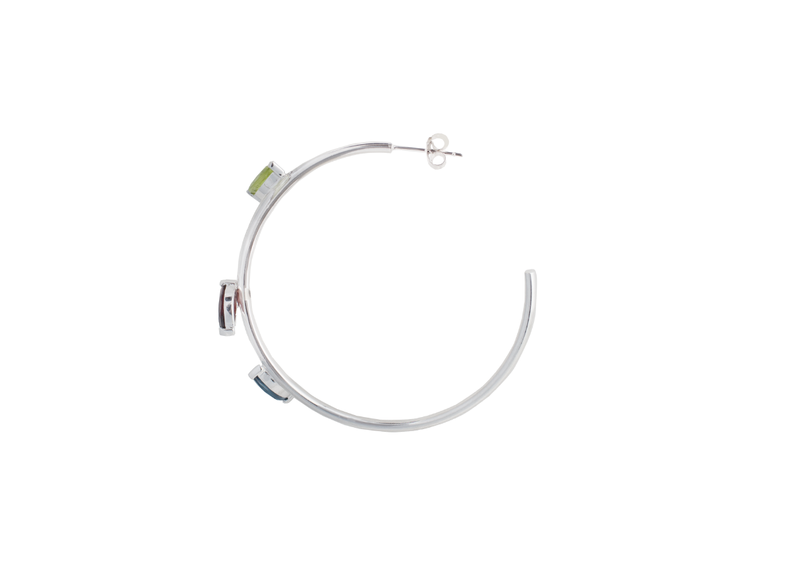 The carefully selected colourful gemstones elegantly trace the contours of these Hoop Earrings. Their simplicity makes a versatile addition to your jewellery collection that you will wear both by day and by night. These earrings are part of the Twigs collection, a feminine adaption of nature’s pure beauty embodied by abstract twigs. 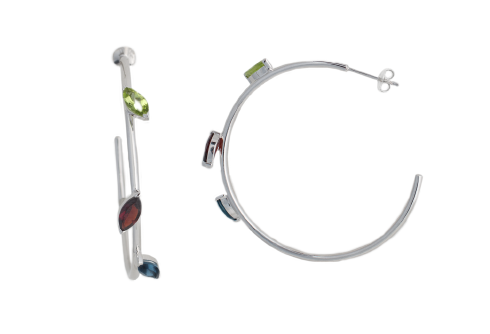 MATERIALS Rhodanized sterling silver Stones: London blue topas, green olivine, red garnet MEASUREMENTS The Hoop Earrings have an inside diameter of 5cm. The butterfly back gives extra stability and comfort. The stones have a size of 8x4mm. CARE The silver is rhodanized to protect it from oxidation, to keep the beautiful shine and make it more resilient against scratches. Anyhow, this delicate piece of jewelry is made of precious materials, which deserve a careful handling. Stones and silver should be protected against any kind of chemicals, including soaps. The jewelry should be stored seperately to prevent it from scratching, the best is to keep the jewelry in the original box after wearing.